I was a college math major who does logic puzzles for fun, and I’m homeschooling a 14-year-old daughter who, until a couple years ago, cried at the mention of the subject. Then there’s the other side of the coin: Maybe you’ve never been confident in your own math skills, so you’re having trouble knowing what your own children know (or don’t know). It’s easy to get hung up on phrases like pre-algebra or probability, derivatives or decimals. And it’s not that those things are unimportant. But the more important part is the bigger picture: Do you, and do your kids, understand the how and why of the use of those things in the real world? I can’t save the planet from mathematical mischief or leap tall buildings in a single bound (which, of course, is totally a physics equation). What I can do is share with you a few things a well-rounded person should know, mathematically speaking. This is the fancy way of saying “Which of these 57 packs of paper towels is the best buy?” It’s probably the most important real-world application of multiplication and division (and fractions) that I know. If you can get a 2-liter bottle of soda for $1.50 or a 1.5-liter bottle for $1, which would you choose? This is something that is easy to get wrong. We tend to have a bias that a bigger pack is a better deal, and sometime is it – but not always. The recipe serves four, but you’re a family of five. What do you do? Fractions and proportions to the rescue! This is one of the most straightforward examples of the “kitchen math” most people do. If you’ve just dirtied the half-cup measure with oil and you need another half-cup of flour, you can fill your quarter-cup measure twice. Most of us do this without even thinking, but it’s an important skill to talk about. My daughter is an incredible example of this. She had no idea as of a year ago that two fourths were the same as one half – or to be fair, if she did know that in theory, she had no idea that it translated into the process of cooking! These come in several forms, with two being particularly important: Making change and balancing a checkbook. The inverse concept is often a hard one to grasp. If you’ve written all your transactions in your check register and there’s a check that has not yet cleared the bank, how do you know if you show the same balance they do? You add that amount back to your calculated balance. That’s an inverse operation, and it’s something many people struggle to grasp conceptually! The same goes with making change. If I give you $20 for a $4.50 product, it’s so much quicker to do the inverse operation – to “count up” from the cost, not subtract from the payment amount. But it runs contrary to the way many of us think! I own a $300 purse that was one of the most economically sound purchases I ever made. Why? Cost per use. If I use this purse every day for a year, my investment is less than $1 per day – about 82 cents. I’m now on my third year, which has put me at about 20 cents per use. I used to buy $30 to $50 purses that would last me maybe three or four months before getting holes or broken straps or big stains. Even at best, my cost per use on those was no lower than 25 cents, usually almost double. Add in the cost of my time shopping for them, and suddenly, I’m better off with the “nice” one in the first place! It might sound silly to break down every purchase like this. But teaching your children that cheap and economical are NOT always the same is an amazing start into real-world consumer finance! This is another area in which your openness with your kids will be rewarded. No matter how you feel personally about credit cards – if you’re 100% OK with them or 100% against them – make sure your children know how interest and loaned money work. If you borrow money, it must be repaid eventually, and generally with interest. The longer you take to repay what you owe, usually the more interest you will pay on top of the original amount. Do your children understand how the “business” of money works – and how they can either gain or lose money as part of it? Have you talked with them about what a bank does with your money – and how you can sometimes earn money by “loaning” yours to the bank temporarily? Maybe these skills don’t seem “complex enough” for high-school math. I assure you, though, they are – and digging into them with your family, looking at how you put everything from pre-algebra to calculus in action, is going to position your children to succeed with real-world math! This post is also part of the iHomeschool Network’s Massive Guide to Homeschooling Math. Also, if you’re into the things we do in our family homeschool, check out my previous “5 days of…” series, 5 days of real-world math. This entry is about curriculum, homeschooling, math, parenting, unschooling. The previous post was The great math curriculum hoax. The next post is Unschooling: Our October 2014 adventures. You had me at purses. 😉 I have to ask, what did you get? Hi Alisa (and hi Rhiley!) Thank you so much for the kind words… I’m so excited for the two of you. I hope you’ll keep in touch and let me know how things are going. I completely agree that these are all must learns, my question then is, what’s the best way to teach them? Tessa, great question! In our family, ALL of this is “taught” just by talking together. None of these are skills that require a formal curriculum, just repeatedly discussing things openly as they happen in your life. 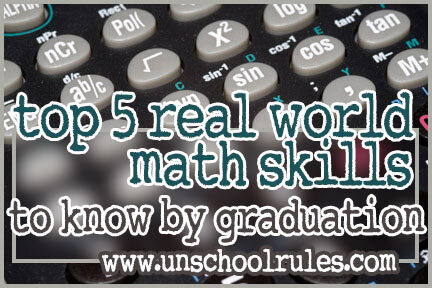 You can see a lot more about how we handle real-world math without a curriculum in the other posts in my real-world math series at https://unschoolrules.com/real-world-math/ – many of those break down specific topics, like grocery shopping or kitchen math, so you can see what we do. I hope that helps! Thank you. I love your site. Deb, thanks! That’s so nice to hear!